I used to love buffets. Oh, the awesome options! I can remember the last one I went to. I got collard greens and pot liquor and cornbread and not much else. Seriously. That’s not something I cook for myself very often, and I was in Heaven. And don’t get me started on church or club or community potlucks. LOVE. THEM. Do we really ever have the pineapple casserole anywhere else? Casseroles are the best. When you see Ritz cracker topping you know you have arrived. My Great Aunt used to add almond slivers to her casseroles, and that just hollered “classy” to us. But that was B. F. A. Almost six years ago to the day I watched my child have a reaction. 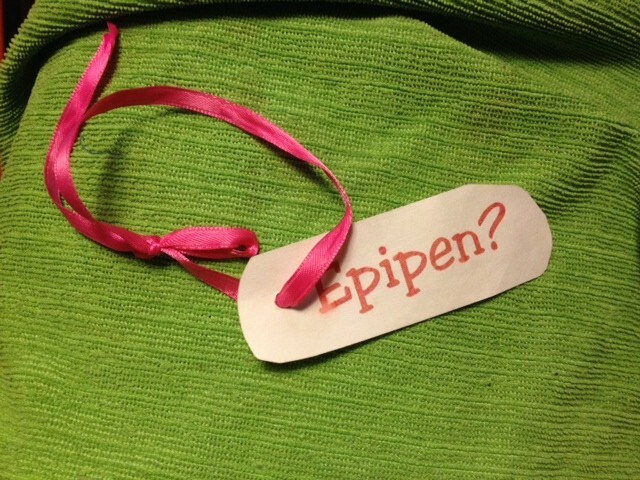 I did not have the epipen with me, which was the last time I put myself in that position. It was terrifying. She survived which I am thankful for with every breath I take. I was aware of the potential allergy before that day, but I let my guard down. No more. Having a child with a food allergy has changed our lives. I have become what some would probably call hypervigilant. I am always looking for the threat. The threat that could come from any direction–a playmate’s hand, a family member’s kiss, a dust of residue on a movie theater seat, a toy in a doctor’s office, from anyone and anywhere at any time. I’m a label reader, looking for that allergen list or the information that is sometimes listed below that, “Processed in a plant that also processes…..” We stay away from those too. Just in case. I haul a sheet with us when we go to the movies. (I’ve found that a twin fitted works really well–covers everything without too much hanging off. I might even try a crib sheet next time.) I carry baby wipes. Everywhere. I burn up the internet on my phone checking allergen lists for restaurants. 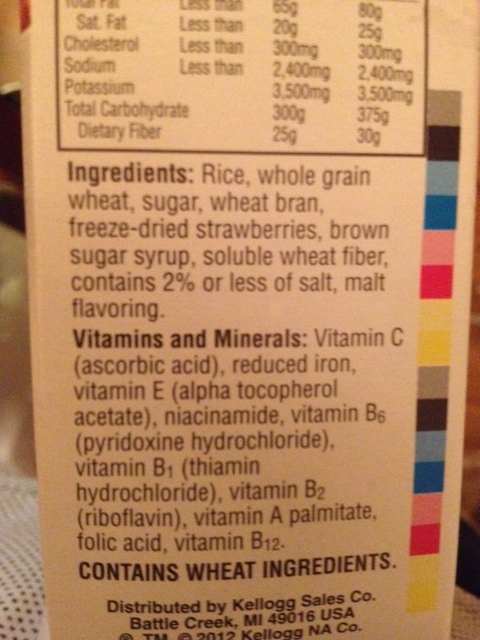 I slide my glasses back and forth (can you say “need bifocals?”) and take three times as long to grocery shop, reading the allergen information on labels. I insist that my child clean her hands all the time and I am constantly saying, “Please don’t touch everything or anything.” We all call out when we see the foods that are off-limits. (Orange is the trigger color for danger.) I find myself staring down other children when they come in with snacks at dance, at soccer games, or in church, assessing what they have and its potential for harm. It’s all becoming second nature for me and mine, but I’m sure from the outside looking in we just seem odd. We turn down invitations to events sometimes. Other times we arrive with our own food in tow, right down to cupcakes in the cutest little cupcake containers ever made. We refuse generously offered food samples and treats. And suckers at the bank. If I can’t read the label, y’all, I’m sorry it’s just not going to happen. I love homemade goodies more than most, but I can’t risk cross-contamination. So more than likely, we will pass. No offense intended. Mama’s way of helping us remember. It still does. We’ve learned to carry around the epipen like lives depend on it, because well, they do. There’s been so much stress over it being left at home or in the hot car in summer or cold one in winter that I am sure one day she will be talking about it on whatever show is the Oprah of her day. Mama, always a problem solver, made us this tag to put in my car to remind us to take it with us or not leave it wherever we had gone. Bless her. It has helped more times than I can count. I’ve read about children who have been bullied concerning their allergies. Other children waving the allergen in front of them, suggesting they might touch them or otherwise expose them to it. Stories like that break my heart. And make me angry. If that ever happened…..I would need bail money. No doubt about it. I’ve also heard numerous stories which did not have happy endings–it only took one cookie or one bite of something from a buffet. These only serve to enforce my hypervigilance even more. We’ve been fortunate on this journey. First of all we live in a day and age of food labeling laws. Thank you God and the FDA. If she were alive a hundred years ago, well, I just don’t think she would be. We have a beautiful family of people who get it and err to the side of caution. They are not offended when I ask to read labels, and years ago the boiled peanuts and peanut butter bars and pecan goodies were left out of our family gatherings. (Anyone from the South can appreciate that sacrifice.) And I love them for it. My Cousin discusses beforehand what’s she baking and bringing to the get-togethers. Mess Cat has a special cabinet of snacks that are safe for us to have when we are over at her house. We have friends who remember the allergies and offer information before I can ask. We have precious friends who washed down their whole kitchen and offered to put the “offending” groceries in the trunk of their car while we were there. That’s love right there. (But not necessary, thank goodness.) Today I was buying some vegetables at a locally owned market. The man I spoke with called his supplier to confirm that they were indeed okay for me to serve my child. Like the restaurant where they offer to cook her food separately from everything else, their “above and beyond” service was appreciated, and we will be back. We are also lucky to have a great allergist who is on top of his game. He has offered to test her in his office on things that I’m nervous about. He even knew about the new epi-pens that talk to you. That it just too cool. He gets my paranoia and worry, and he is a calming force. Something I need. It’s taken time but I’m back to breathing. I can remember a couple of times about three years ago when we went to a restaurant that I had checked out beforehand. I told the server when ordering as I always do, “My child has a food allergy. Just letting you know.” No problem. So we ate. And toward the end of the meal, my child would start acting differently, saying she didn’t feel good. I would go into near panic, asking constantly, “Can you breathe?” And we’d get through it. I’m not even sure what was going on with either of us, but we now call those “melkdowns.” And we don’t have them much anymore. I’ve learned to swallow the panic and observe carefully and calmly and rationally: she’s breathing, she’s fine, we’re okay. Honestly? I think it’s possible she was mirroring my panic and anxiety. Here’s the thing. I don’t expect people to cater to us or to feel uncomfortable carrying on as usual. She is adapting quite well and understands when I tell her she can’t have this bubblegum or that ice cream bar. We compensate for it later at home, and she gets it. What I do hope is that people understand when I say no, or when I just can’t find it in me to come to this event or that party or this special occasion. Sometimes it’s just more than I can handle or I feel like the risk might be more than I’m ready to take on. It’s not that I don’t trust you. It’s that I can’t trust anyone or anything–I have to question everything. It’s my job. To protect her first and foremost–that’s my top priority. I don’t mean to offend or hurt feelings, it just is what it is. I don’t know what the future holds. No one can tell me why she has these allergies and no one knows if a cure will be found. I hope with all my heart that they will find something so that I can send her off into the world one day and not worry every second she is away from me. Until then, if I seem overprotective or if I turn down an invitation or gift of food, please understand and forgive me. She is my gift from God, a treasure–and it’s all I know to do–to protect her and keep her safe, no matter what it takes. My brother carries an epipen for his shellfish allergy. It’s scary when you stop breathing because someone cooked your fish in a pan that had been used for shrimp! He eats a lot of hamburgers at the beach. Thanks for this insight, Tara. I also enjoyed the blog you linked.